2. Discard soaking water or use on houseplants for a boost of minerals. 3. Place water and wakame in a soup pot and bring to a boil. 4. Add root vegetables first and simmer gently for 5 minutes or until tender. 5. Add leafy vegetables and simmer for 2-3 minutes. 6. Remove about 1/2 cup of liquid from pot and dissolve miso into it. Return it to the pot. 7. Reduce heat to very low; do not boil or simmer miso broth. 8. Allow soup to cook 2-3 minutes. 9. Garnish with scallions and serve. • Add cooked grains at the start of making the soup. They will become nice and soft. • Add a tablespoon of uncooked quinoa or millet at the beginning and let it cook with vegetables for 20 minutes. • Add cubed tofu toward the end. • Add bean sprouts toward the end. • Season with 1/2 teaspoon ginger juice for an interesting twist. 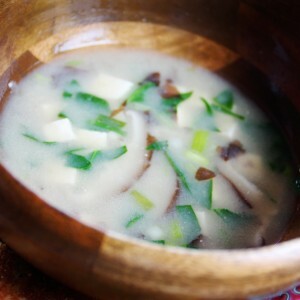 • If using dry shiitake mushrooms, let them soak for 20 minutes, slice and add at the beginning. This entry was posted in Recipes by servicebyte. Bookmark the permalink.